In the heart of Penrhyn Bay, St. David’s extends a warm welcome to all to join us for worship and fellowship. You are very welcome to join us for refreshments after the Sunday 11am services and Friday 10am service. On Fridays we have a coffee morning until noon. This is an ideal time to pop in and linger longer over a cup of tea or coffee. We have our regulars who are a mixed group of church members and non church members. Prayer Group meets at 10am each Tuesday at St David’s. Additional parking on Beach Road East. Fancy an afternoon tea and a friendly chat on Thursday afternoons? Join an Ann Beardmore community event held in St David's Church Hall on the first Thursday of the month from 2-3.30pm. £3 per person – pay on the door. Do you know of someone who would like to come and needs picking up? Lifts can be arranged. If you know someone who is housebound, a plate can be delivered to them at home. A new kitchen facility was installed in the recent past at the rear of the church at St David's and has been a great addition to the facilities available for functions and the serving of refreshments after the services on Fridays and Sundays. However it was always felt that the surrounding area was a little bare as the expanse of wall around the kitchen was plain painted walls. Everyone felt that something was needed to break up the bland area of wall but no one could be certain of what was needed or how to resolve the problem. Coincidently and at almost the same time, we came across an image which we felt was perfect for a mural - a country scene with the words of Psalm 23 entwined around the mountain, river and fields scenery - and we also became aware of a wall artist who could create the picture we had found on the wall. We therefore commissioned Jonathon Lloyd from Kinmel Bay to paint the mural and he spent a week on a scaffold tower recreating the image which he has surrounded in a painted window frame in the same shape as that of the existing windows in the Church to give the feel of a view though a window. The end result is a stunning image which is eye catching from every part of the Church and has brightened up the rear of the building to achieve exactly what was required to complete the kitchen project. We are so grateful to have funded the project with donations/legacy in memory of Ron Jones, Dorothy Evans and Bessie Royal and their names have been discretely included within the mural. We are also very grateful to Jonathon for his talented work. The mural was dedicated as part of the service on Easter Sunday which was a fitting conclusion to the kitchen project which has taken some time to come to fruition. 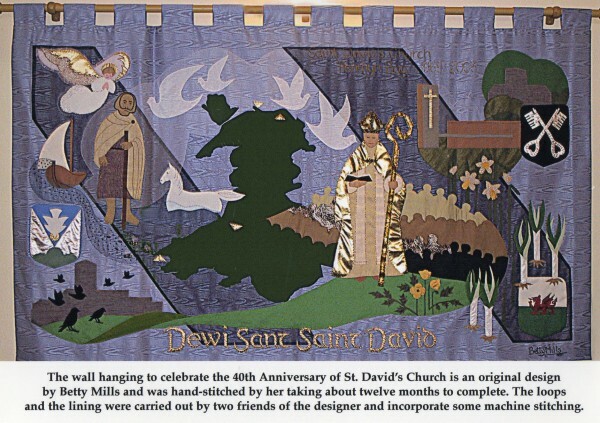 The first St David’s Penrhyn Bay church was in St David’s Road. It was dedicated on 17th October 1929 by the Lord Bishop of Maenan and was of wooden construction, costing £3000. This building, with seating for 250 people, had a school room/hall for a further 100. Before the building of this church, services were held in Penrhyn Old Hall chapel. 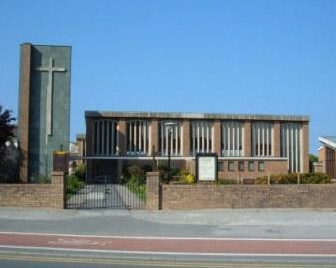 The building was severely damaged by a storm in 1956 and, with a growing population in Penrhyn Bay, the decision was taken to build a new church. Every house in Penrhyn Bay was invited to make a contribution and even a milk churn was used as a collecting box on the as yet vacant site. Through the generous gift of a plot of land from Lord Mostyn, and built by local builders Peter T Griffiths, the new church costing £26,000 was consecrated on 7 September 1963 by the Bishop of St Asaph Dr. D D Bartlett with 400 people in attendance. The church was a bridge between the old village and the new Beach Estate and had a thriving congregation, choir and the usual church affiliated clubs and groups. The church hall was funded from the sale of the St David’s Road site plus the sale of the parsonage which with donations came to £114,000. The builders R L Davies & Son of Llysfaen completed the work in six months opening on 10 July 1985. The church hall continues to be used on a daily basis by a wide variety of community groups.